As the Democratic National Convention roars on, news broke that a record 46.7 million Americans – or roughly one in five adults – used food stamps during the month of June. The U.S. Department of Agriculture (USDA) made the announcement and the news is more than slightly alarming – not to mention proof that the Obama Administration had better step up to the plate – and fast; the election is but sixty days away. 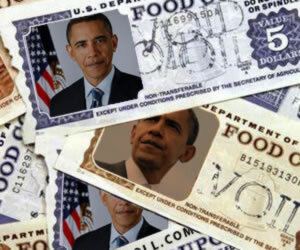 Since October 2008, when President Obama was elected, food stamp use has spiked 51 percent. The economy then was in free fall and especially in the past year, analysts continue to insist the economy’s on the mend. These numbers serve as proof that anything but is occurring. The number of Americans now using food stamps is roughly the same as the number of Americans living in poverty. Make no mistake – food stamps are a tremendous financial burden on the backs of taxpayers. So much so that a new record was broken in FY 2011. Food stamp programs cost taxpayers $71.81 billion. That number is up by a whopping 43% from 2010. The numbers released by the U.S. Department of Agriculture showed a slight increase from enrollment in May, which was about 46.5 million and serve as a reflection of the considerable increase from the time when President Obama took office, when enrollment was at roughly 32 million. The numbers break down to $133 per person per family. What’s particularly disturbing is a recent Tennessee journalistic investigation that revealed a lot about how these monies are actually being spent. It was reported the traditional paper food stamps have been replaced with EBT cards that can be used anywhere – including ATMs where recipients can withdraw cash. This is happening in several states. It was revealed that taxpayer money is being used for a number of things, including tickets to Graceland, shopping sprees, restaurants, bars, and even liquor stores. The study, conducted by a consumer watchdog group, watchdog.org, also includes admissions by government employees that they cannot account for the money after it’s been placed on those EBT cards. One transaction was completed in liquor store where almost $800 in cash was withdrawn. It’s hardly surprising, then, that many still cannot put food on the table. It was reported that one in five Americans who receive food stamp benefits do not have enough to buy groceries before their new allotments are placed on the EBT cards. This means that the belief of some analysts who insist spending on food stamps is an effective way to jump start the economy is moot. They say every dollar spent on food stamps leads to $1.73 circulated through the economy. If the monies allotted for food aren’t being spent on groceries, then their mindset and beliefs are skewered. Clearly the remarks made during the Democratic convention the past few evenings are misleading. These numbers do not reflect an improving economy. Republicans point to indicators like food-stamp enrollment to make the case conditions have only worsened. Republican Sen. Jeff Sessions of Alabama has complained that the government has made an “active effort” to guide people onto the food stamp rolls regardless of need. Those accusations were met with denials from the Obama Administration. There were fewer than 31 million people on food stamps in November 2008, but an aggressive effort from President Obama’s administration has helped build participation, with the total increasing by 44 percent since the president took office in January 2009. It appears the president would prefer a nation of unemployed, dependent taxpayers who begin a new tradition of passing down the absence of personal responsibility to an entirely new generation. Citigroup economist Steven C. Wieting, in a recent analysis, said there are more than 3 million Americans who are still unemployed and whose jobs weren’t in the the real estate or mortgage sectors. He said recovery will be incredibly slow as those “noncyclical job losses will be more difficult to remedy”. Still without work who lost their jobs following the financial crisis but did not work in the housing-related industries that suffered most. But it’s three steps back and one step forward and lots of cyclical improvement in the economy from very depressed lows. But we are very, very far from having normal labor markets. The economy has fewer good jobs now than it did at the start of the 21st century…it’s important to recognize that the U.S. labor market was already in trouble before the Great Recession, the result of 30 years of growing wage inequality and shrinking numbers of good jobs. The economy, he said, is “on a path to seven years just to get back to the employment level where you were at the start of the downturn,” and suggested the economy is closer to depression than it is the inflation that would signal sustained growth. Those receiving benefits through the Supplemental Nutrition Assistance Program numbered 46.37 million, according to a government report. There’s no denying all of these numbers come together to paint a more accurate picture of the true economy, despite assurances from that same government that the recession ended in 2009.
says Peter Cardillo, chief market economist in New York. He goes on to say it’s an indication of how the jobs market has stagnated and the growing number of people applying for and receiving food stamps cements that stagnation. So with a full 15% of Americans receiving food stamp assistance, will this play in role in how the elections will turn out? We’re down to less than sixty days and in a campaign where few Americans trust either candidate, it could be a wild card. Predicting who will walk away with presidency has become increasingly difficult. With a “soaring” number of people signing up for the SNAP program, one thing is for sure: no matter who wins the election, it’s the taxpayer who ultimately loses.